Six and a half years after April Kauffman was found dead inside her home, a former Pagan’s motorcycle gang member learned his fate for the murder. A man convicted in the slaying of a New Jersey radio show host in an alleged plot to prevent her from exposing a drug ring will spend the rest of his life behind bars. Ferdinand Augello was sentenced to life in prison plus 30 years for murder, conspiracy, racketeering, leading a drug ring and other counts in the 2012 shooting of April Kauffman. Being a drug ring leader got Augello life behind bars while murder got him 30 years. The other counts got lesser sentences that will run concurrently. Augello continued to maintain his innocence when he was sentenced Wednesday. Ferdinand Augello was found guilty in the murder-for-hire killing of April Kauffman in her Linwood home back in 2012. He will learn his fate Wednesday. Atlantic County prosecutors say Augello and the woman's husband, Dr. James Kauffman, wanted to stop her from exposing a drug ring allegedly run by the doctor and members of the Pagans Outlaw Motorcycle Gang. Kauffman killed himself in jail in January while awaiting trial. As part of the sentence, Augello can't apply for parole until serving at least 55 years. Defense attorney Mary Linehan and Augello questioned the reliability of Andrew Glick, the state's witnesses. They said the state's evidence points to Glick, a former gang official turned informant. 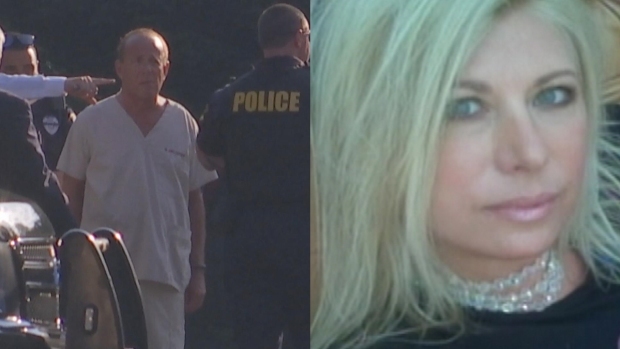 Officials announced Tuesday that Dr. James Kauffman of Linwood, New Jersey is charged with hiring a hitman to murder his wife, radio host April Kauffman, after she planned on divorcing him and exposing his alleged drug operation with a motorcycle gang. NBC10's Cydney Long has the details.